To return to WRAH.net, click the image above. We will be closed the first Wednesday every month from 8:00 to 9:30 AM for an educational staff meeting. Appointments for regular procedures appreciated. The only full service AAHA accredited practice in Greeley. This quarter, West Ridge Animal Hospital is focusing on Pet Prevention and the different ways to inhibit health issues in our pets. There are many different ways to prevent health issues and one approach is surgical. One surgery in particular has had marked success in minimizing the number of animals with hip dysplasia. This surgery is called the Juvenile Pubic Symphysiodesis (JPS) and is performed in puppies between the ages of 15-20 weeks. If you have ever watched your beloved 12 year old Labrador struggle to get up off the floor you know exactly what we are referring to. Hip dysplasia is a degenerative disease in which dog shave poor fitting hip joints. Typically, the ball and socket joint fit together neatly, allowing a dog to move their legs freely and without pain. If the animal’s joint does not fit together properly, as in the case of hip dysplasia, they are more prone to developing arthritis and pain in their joint area as they age. Motion of the hip joints slowly causes erosion of soft cartilage, causing the bones to rub together increasing pain. Hip dysplasia can occur in any breed, but is predominant in the larger dogs, particularly the German Shepherd, St. Bernard, Labrador Retriever, Pointers, and Setters. Although hip dysplasia is a genetic condition, research shows that environmental factors can also put a dog at risk. Overfeeding (especially of puppies) can predispose a dog to hip dysplasia. Excessive exercise may predispose dogs as well. Those who adopt a breed of puppy prone to dysplasia should ask their breeder if they have done any screenings on their dogs. 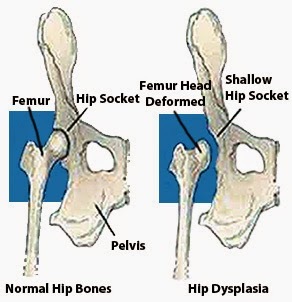 There are several different signs of severe hip dysplasia. Symptoms usually appear before the dog reaches one year of age and may include pain in the rear legs, incoordination, limping, and difficulty rising. Those with less severe cases may not develop arthritis or other symptoms until they become older (6-10 years). Surgical procedure in young dogs such as the JPS is a more successful option than drugs for treating severe cases of hip dysplasia. Surgeons can improve the joints in young dogs by making changes to the shape of the femur or pelvis. During the JPS procedure, the pubic symphysiodesis, which is the cartilage seam connecting the left and right sides of the pelvis, is electrocauterized (or removed) to induce bony fusion and to stop the continued growth of the growth plate. This then allows the pubic bone to grow normally and allows for a tighter and healthier hip joint. Much like humans who have joint problems, dogs that are diagnosed with hip dysplasia should not be free of exercise. Exercising at the dogs own pave can help loosen up the stiffness in the joints. Weight is a big factor as well. Shedding extra pounds can cause relief to the joints and bones. Those dogs that do have arthritis should be kept away from the cold since cold weather can aggravate aching joints. If you are concerned about your dog having hip dysplasia or you want to do everything you can to prevent it, please talk to your veterinarian about the JPS procedure (www.WRAH.net/care/procedures/JPS.html) when scheduling his or her spay or neuter. Your pet will thank you for it!